CLEMSON, S.C. (AP) — Few teams seem to have needed time off this season more than No. 4 Clemson. 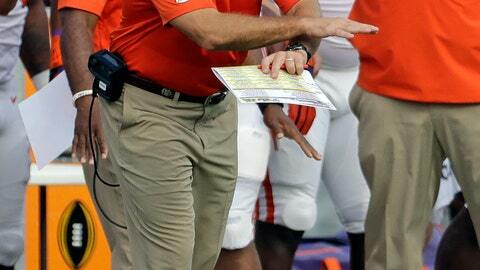 Clemson (6-0, 3-0 Atlantic Coast Conference) returns to the field with a home game against No. 20 North Carolina State (5-0, 2-0) on Oct. 20. Before then, though, Clemson will spend a couple of days at practice, take part in a team community service project at its home facility Tuesday before a weekend away from campus — and the football field. The upheaval started two weeks back when Clemson named freshman quarterback Trevor Lawrence as starter over well-respected senior — and last year’s starter — Kelly Bryant. Last week when things seemed like they were returning to normal, Clemson received the news of Fuller’s death. Fuller was with the Tigers from 2014 through 2017, was a backup on the national championship team two seasons ago and only announced this past February of his intention to play elsewhere as a graduate transfer. Pickens County Coroner Kandy Kelley said a cause for Fuller’s death won’t be known for six-to-eight weeks. Swinney said in a radio interview last Thursday that he wasn’t sure if “it was a blood clot or seizure” that led to Fuller’s death. “I can’t help but think C.J. was smiling on that, to see his guys perform like that in the running game,” Swinney said. The 6-foot-6 Lawrence is grateful for the downtime, too. He acknowledged the difficulty of balancing the joy of gaining the starting job and seeing a trusted mentor in Bryant depart. “I wish he were still here,” Lawrence said., who noted the two have kept in contact and maintain a strong relationship.